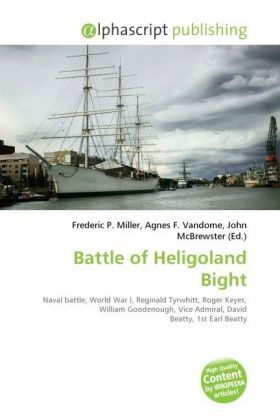 The First Battle of Heligoland Bight was the first naval battle of the First World War, fought on 28 August 1914, after the British planned to attack German patrols off the north-west German coast. The German High Seas Fleet remained largely in safe harbours on the north German coast while the British Grand Fleet remained in the northern North Sea. Both sides engaged in long-distance sorties with cruisers and battlecruisers, and close reconnaissance of the area of sea near the German coast, the Heligoland Bight, by destroyer. A plan was devised by the British to ambush some of these destroyers on their regular daily patrols, and a fleet of 31 destroyers and two cruisers under Commodore Reginald Tyrwhitt and submarines commanded by Commodore Roger Keyes was dispatched for this purpose. This was supported at longer range by an additional six light cruisers commanded by William Goodenough, and five battlecruisers commanded by Vice Admiral David Beatty. Three German light cruisers and one destroyer were sunk. Three more light cruisers were damaged, 712 sailors killed, 530 injured and 336 taken prisoner.